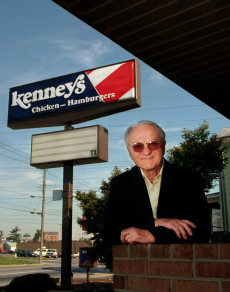 "Founder of Kenney's Burger Chain Knew Secret to Keep Customers Coming"
Called a "visionary," Bill Kenney had several other restaurants and was a pioneer of the convenience store. He died Monday. Some say it was the secret sauce. Others say it was the classic decor of the restaurants. Still others loved the whole combination -- the messy, greasy deliciousness that was a Kenney's burger. The man credited with creating that phenomenon and launching a generation of fast-food-loving diners in Southwest Virginia died Monday. William "Bill" Kenney Sr., of Roanoke County, was 91. As a 37-year-old franchisee, Kenney opened a Biff Burger Drive-In in 1958 on Williamson Road in Roanoke -- one of the first fast-food restaurants to be established in the area at a time when McDonald's was only just getting its start. He went on to open several Biff Burgers in the region in the late '50s and early '60s. Kenney learned from the Biff Burger franchise and replicated that style in his own restaurants. In 1962, the Biff Burger locations in Southwest Virginia changed their name to Kenney Burger Drive-Ins, simply referred to as Kenney's. The burgers there, like at Biff Burger, were known for the secret sauce into which patties were dipped that kept customers coming back. The restaurants were also known for their distinctive architecture, an A-frame-style building and a downward arrow sign advertising the burgers for only 15 cents. A dollar would get you six hamburgers with change left over for a drink. For years Kenney operated other businesses as well. An entrepreneur at heart, Kenney opened several restaurants in the Roanoke Valley and Southwest Virginia, including Kenney's Americana and Ken-Johnson Restaurants. In a 1978 interview, Kenney said he was trying "to make restaurants more sophisticated ... people feel a hamburger place doesn't have to be a joint anymore." At one point Kenney had 12 burger restaurants in the Roanoke Valley and 52 throughout Virginia and West Virginia. By the time Kenney's Franchise Corp. filed for bankruptcy in early 1980, he had just 18 open. He said at the time that one of the main reasons was "those other guys [restaurants] are doing good." Just three original Kenney's locations remain open, albeit under different ownership: in Lexington, Buena Vista and Lynchburg. Kenney was also a pioneer in establishing convenience stores. He opened a dozen in Roanoke and 19 more throughout Virginia called Bantam Markets. "He was a visionary," said Kenney's son, Bill Kenney Jr. "He was the first guy in Roanoke to have gas at a convenience station. Now, of course, every convenience station has gas -- that's a given." Kenney Sr. was born June29, 1921, in Smoky Lake, in Alberta, Canada. He served in the Canadian navy from 1943 to 1946 before attending the University of Toronto. He said in a 2009 Roanoke Times article that he wanted to study engineering but ended up learning to manage hotels and restaurants. After graduating in 1949, he worked in Europe for a while before returning stateside. "I had a wanderlust," he said in 2009. "I always wanted to get my own business and I thought America was it." In his later years, Kenney served on the board of the local Salvation Army and was active with Habitat for Humanity. In the 2009 article, Kenney estimated he'd raised more than $100,000 for Habitat by bottling and selling the sauce that made his burgers so famous. Kenney's first wife, Evelyn, died in 1991, and a daughter, Cheryl, died in 1979. He is survived by his second wife, Connie, and three adult children. Kenney Jr. said his father had been having cardiac troubles recently but was otherwise healthy, and had been golfing as late as last week. Kenney Sr., who lived with his wife in Roanoke County, died in his sleep Sunday night after he and his wife ate dinner out and watched the 11 p.m. news, his son said. He said funeral arrangements are still pending, but that a visitation was likely to be scheduled for Friday evening at Oakey's South Chapel and a memorial service Saturday at Rosalind Hills Baptist Church. Kenney Sr. will be cremated. Staff researcher Belinda Harris contributed to this report.